Macedonian Pharmaceutical Bulletin, ISSN 1409-8695, is an international, peer-reviewed Journal, published under the auspices of Macedonian Pharmaceutical Association. The Macedonian Pharmaceutical Bulletin has a mission to be the premier periodical on basic pharmacy concepts, recent developments in pharmacy in general, with an aim of promoting Research and Development, Post-Graduate Training, and further enhancements in the field of Pharmacy. 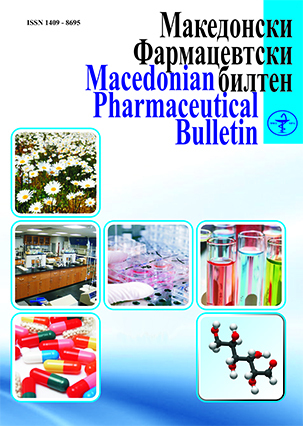 Macedonian Pharmaceutical Bulletin publishes original articles in basic and applied research, reviews, in areas related to pharmaceutical sciences as well as other life sciences, and professional papers. Areas of interest include Pharmaceutics, Pharmaceutical Technology, Pharmaceutical Chemistry, Bulk drugs, Pharmaceutical Analysis, Quality Assurance, Medicinal chemistry, Immunology and Immunochemistry, Biopharmaceutics, Pharmacokinetics, Pharmacology and Toxicology, Clinical Pharmacy, Pharmacognosy and Phytochemistry, Phytotherapy, Food and Nutrition, Pharmacy Practice, Pharmaceutical Marketing and Management, Pharmacoeconomy and Pharmaceutical Education. Its international readership is reflected by the prestigious international Editorial Board and worldwide reviewers. There is no fee for submission, processing, or publication of manuscripts. Macedonian Pharmaceutical Bulletin is an open access journal which means that researchers worldwide will have full access to all the articles published online and be able to download them directly from this website. The journal is indexed in DOAJ Directory and EBSCO Host – Academic Search database.